You know how I love reptiles and amphibians. I would guess that of the two I am really more excited about the variety of amphibians. Our largest WV salamander is the hellbender, Cryptobranchus alleganiensis, which reaches a length of over two feet in length. 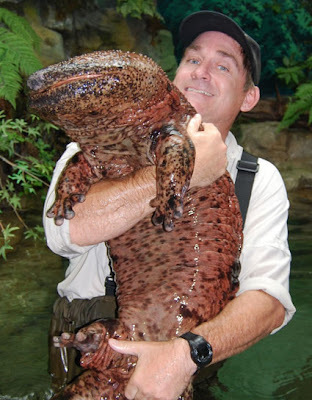 The salamander above looks like a hellbender, but is much larger and is the largest salamander in the world with a length exceeding five feet. 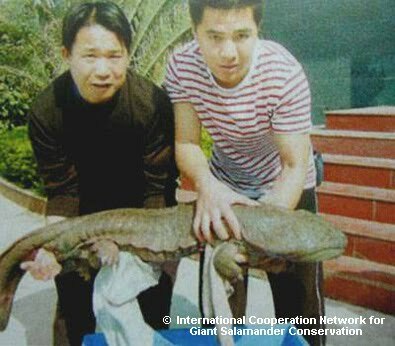 This largest salamander is the giant Japanese salamander and you can see from the article below why I am so excited. WASHINGTON — The Smithsonian National Zoo is opening a breeding center for Japanese giant salamanders as part of an effort to save amphibians from a deadly fungus. The zoo's breeding program opening Thursday will be the first time the species that grows up to 5 feet long has been bred outside Japan in more than 100 years. 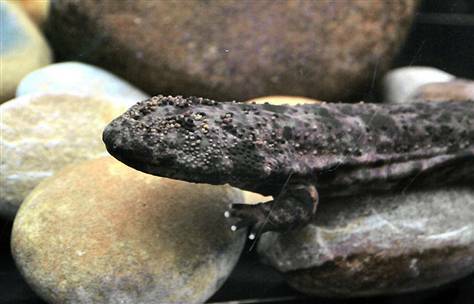 The zoo in Hiroshima, Japan, is donating four salamanders to Washington's zoo. Local students helped Japan's ambassador name one salamander "Hiro," to represent its home city. The salamanders are listed as "near threatened" by conservation groups. Zoo scientists hope to learn more about the chytrid fungus that is deadly for some amphibian species but does not seem to kill these salamanders. Scientists will study their immunity to try to save other amphibians around the world. How in the world did they get this photo? The answer is that folks were taking photos/videos during a whale watching expedition and someone captured the images at the opportune moment! 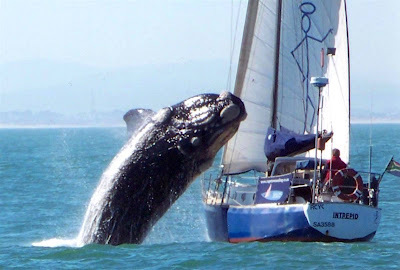 A couple on a yacht outing off the coast of South Africa get a giant shock when a 40-ton southern right whale jumps out of the ocean and slams into their boat on July 21. 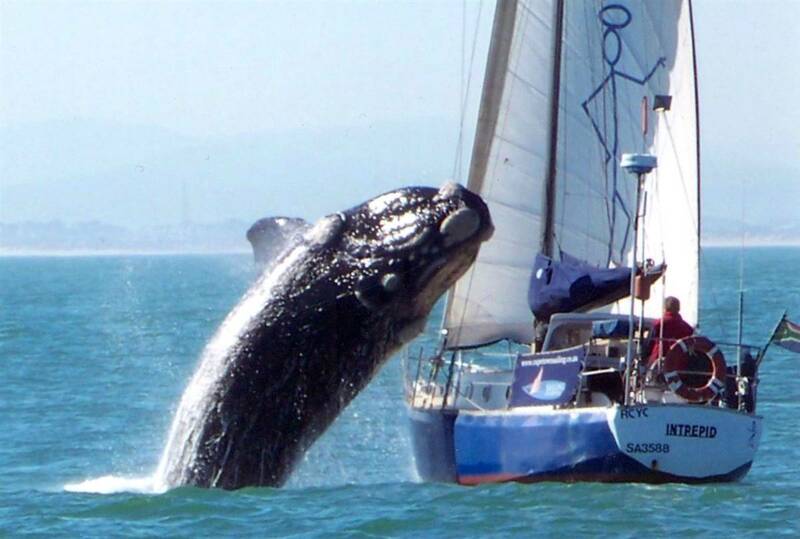 The whale destroyed the boat's mast and then returned to the water. The couple were not injured. Oh, my PETA friends are really going to be disturbed by this article! It's 55 percent and wrapped in roadkill, is this the world's most 'shocking' beer? The End of History is billed as the strongest, most expensive and most shocking beer in the world by its Scottish makers. You'd expect a lot from a bottle of beer costing $765. 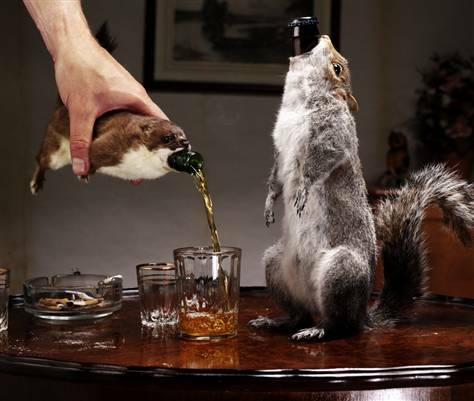 What you get is 55 percent alcohol — and served in a squirrel. Thought this morning I would review just a few of new species that were discovered last year. Let's go first to California. The bomb-dropping worm, Swima bombiviridis, below is among the top 10 species discovered in 2009, according to the International Institute for Species Exploration at Arizona State University. The annual roundup winnows down a list of about 20,000 species described each year to just a few mind-benders. You have to love a rat eating plant! This is a scary fellow! In this age of vampire hysteria, a minnow with toothlike fangs is a shoo-in for a top 10 list. Happy to report that yesterday's PET scan showed no tumors resulting from my old enemy, Hodgkin's Lymphoma. I passed this test with flying colors. 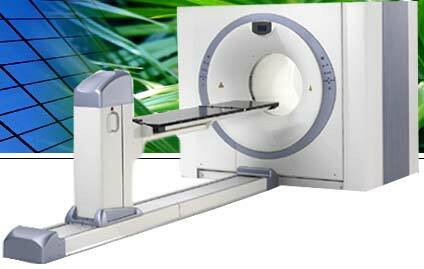 Another PET scan will be in three months. I certainly thank you all for your concern and caring. Your prayers are important and are appreciated. 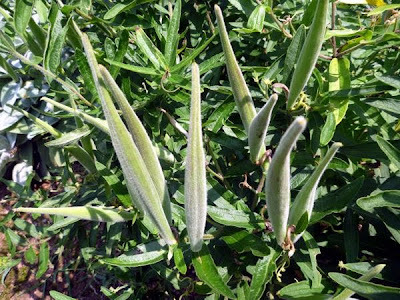 As you see from the above photo, the butterfly weeds have now gone to fruit. 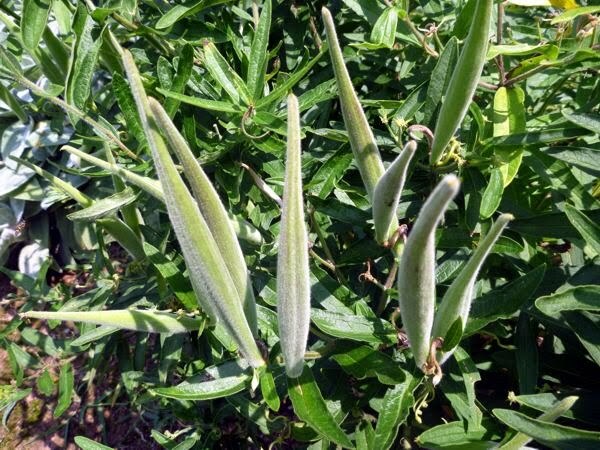 The pods will soon open and the silk laden seeds will float to other parts of our garden. 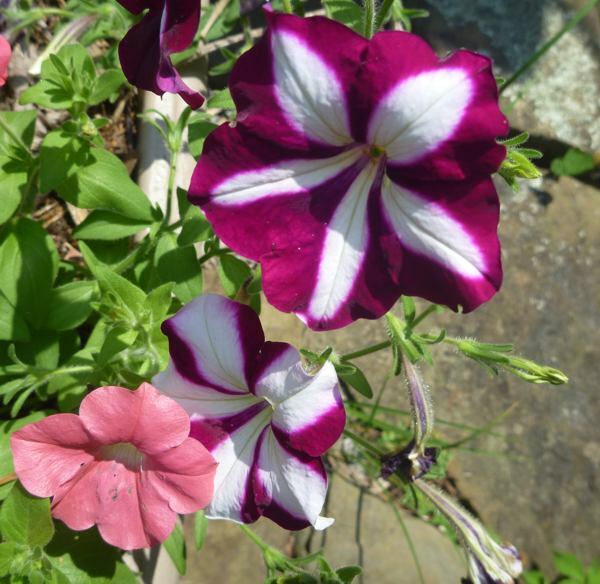 The wave petunias are thriving. 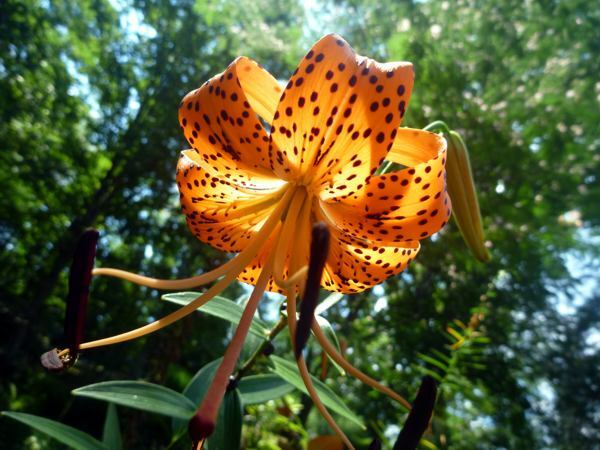 It is lily time in our flower beds! 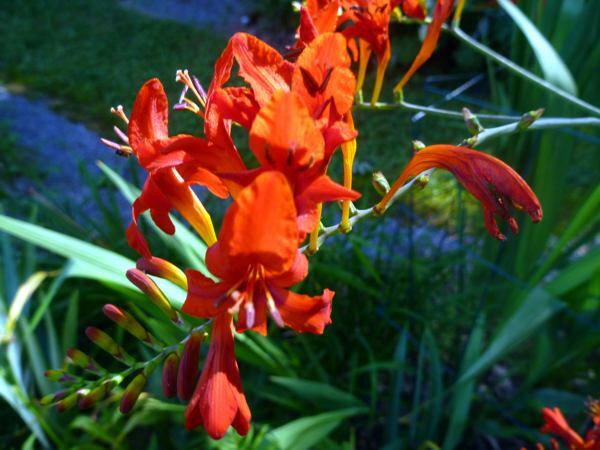 Even the glads are happy with this hot weather. I shall keep you posted on the plant cycles in the Meads habitat. 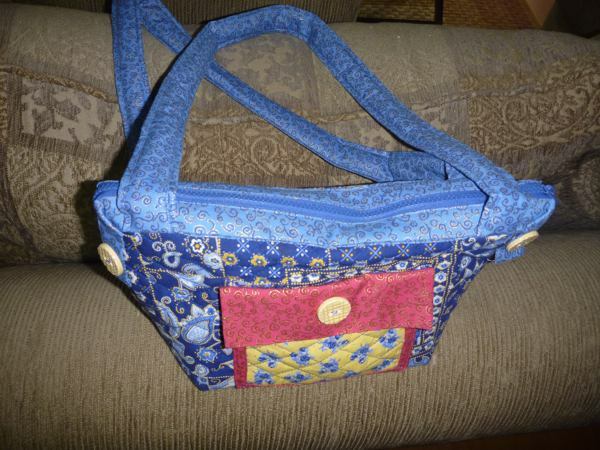 Judy has been working on her purse and it is finally finished. 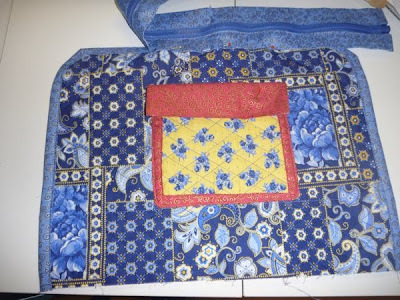 I am so proud that she enjoys sewing and is able to learn so many new sewing skills. The fabric of the pockets reflects the lining of the purse. The inside has many pockets for many different sized items. 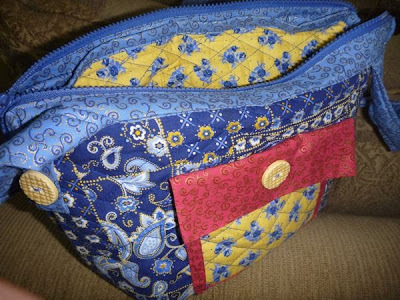 The finished purse is adorned with ceramic buttons. I realize that our blog title sounds like a science fiction movie. I thought this morning I would share photos of a few wonderful deep sea critters. Scientists from the Queensland Brain Institute have used high-tech cameras to photograph sea creatures at a depth of 4,600 feet at the Osprey Reef in the Coral Sea, northeast of the northern Australian city of Cairns. 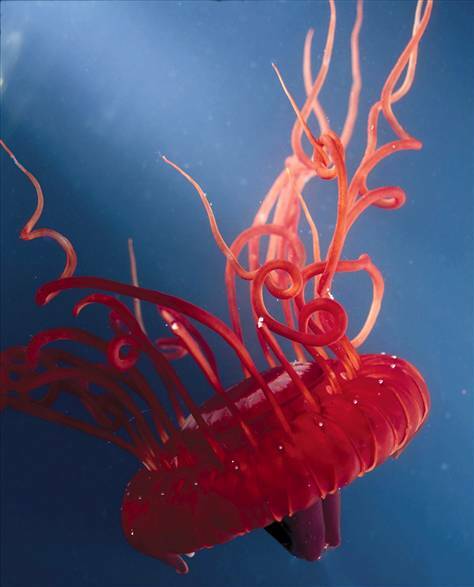 Above is a deliciously red Atolla jellyfish. Below you will see the viper fish! 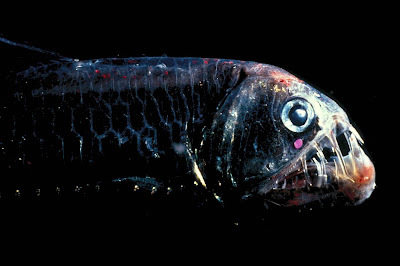 The viperfish is considered one of the oddest-looking and most ferocious fish of the deep ocean. Its fangs are so large that they cannot fit inside its mouth, but instead curve back very close to the creature's eyes. The viperfish is thought to use its teeth to impale its victims by swimming at them at high speed. 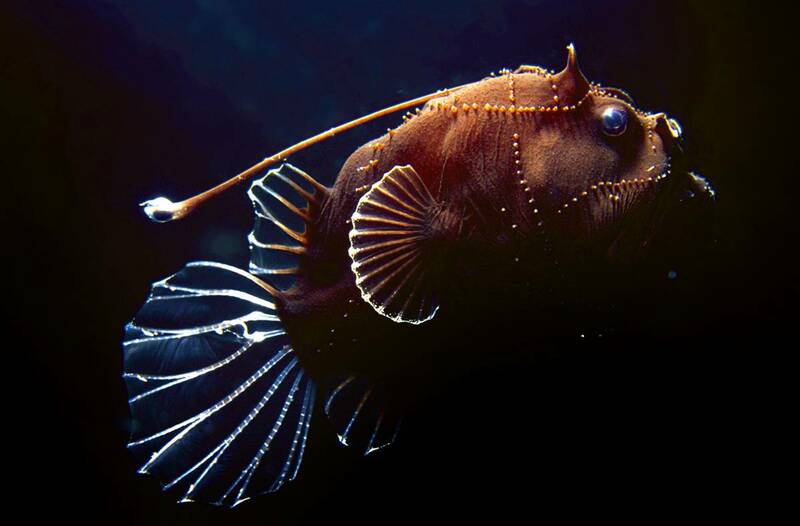 The deep-sea anglerfish below is well-adapted for living in a dark world where the pressure is 140 times greater than on land. "Learning more about these creatures' primitive eyes and brain could help neuroscientists better understand human vision," research team leader Justin Marshall says. "We could also design better cameras and illumination systems because, as we've seen, nature often gets there first." And I will end with this lovely. The deep-sea hatchetfish gets its name from the shape of its body, which looks like an ax head. 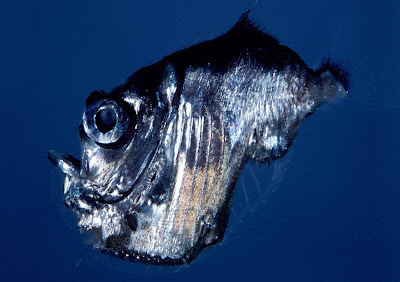 It may be a warlike name, but most hatchetfish are actually rather timid. 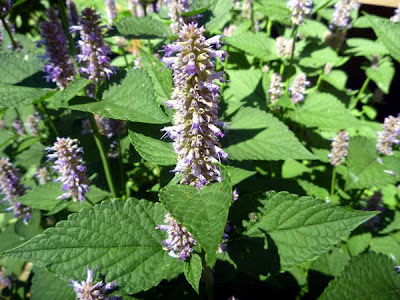 The social insects are fantastic when it comes to environmental adaptations. The article below illustrates just a few of the aspects of our friends, the ants. Terrorism doesn't just exist among humans, according to ecologist Mark Moffett, and he has the photos to prove it. In his new book " Adventures Among Ants" (University of California Press, 2010), Moffett describes — and shows — how some ants will commit suicide in a very dramatic way while taking others out with them. Moffett told me that in this photo, "the reddish worker cylindricus ant has detonated — rupturing her body to release a toxic yellow glue that kills her and the enemy instantly." Just before this picture was snapped in Borneo, Moffett had set a trap at the base of a tree colonized by cylindricus ants. The trap was simply some honey that he drizzled around the tree trunk. 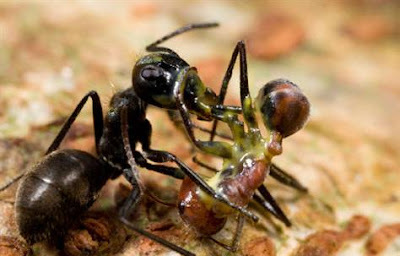 "After an hour, weaver ants along with another species of carpenter ant located the bait and started arriving at the cylindricus-occupied tree. One of them started up the trunk, but then came down again. That one would live another day. Another climbed a bit higher and attempted to walk by a cylindricus minor worker. Just as I clicked the shutter there was a splash of yellow, and both ants were immobilized in a sticky, grotesque tableau." In his book, Moffett describes yet another species of cylindricus ant that includes "living doors." The major worker's head flattens into a disc, he explains, "enabling her to serve as a living door to nests in hollow branches. She allows her nestmates inside only after they identify themselves by tapping the blockading disc with their antennae." When he tried to grab a minor worker that was climbing the tree trunk, an additional protective measure took place. He said the "ant's leg fell away in my hand, in much the way that a lizard will lose its tail." Moffett also describes a Brazilian species, Forelius pusillus, that kills entire ant nests at a time. "Up to eight sacrificial individuals stay outside at night to seal the entrance with sand, kicking the final grains in place until no trace of the hole is visible. Walled off from their sisters, by dawn almost all are dead, for reasons unknown—perhaps the squad consists of the old or sick. The ants in the nest then clear the passage to begin the day’s foraging. That night, more victims seal the door." To understand such behavior, Moffett suggests that we think of an ant colony like a single organism. Cutting off a "minor" part may help to save the colony as a whole. "The larger the colony, the less consequential the casualty," he said. "Such extremism in handling risk is an example of how death without reproduction can be of service to queen and colony, and a reminder that anything humans concoct — even suicide missions and terrorism — probably has a parallel in nature." Could it be that the ever-ballooning human population means more terrorism and warfare are in our future? No one knows for certain, but as Moffett ominously points out, the bigger a population becomes, the more it can take large-scale risks, "given that losing 10 percent of an army will be more devastating for a society of ten than for one of a million." "The protein had been identified before and it was linked to egg formation, but by examining it closely we have been able to see how it controls the process," he said. Professor John Harding, from the same department, said the discovery could have other uses, according to the Daily Mail. 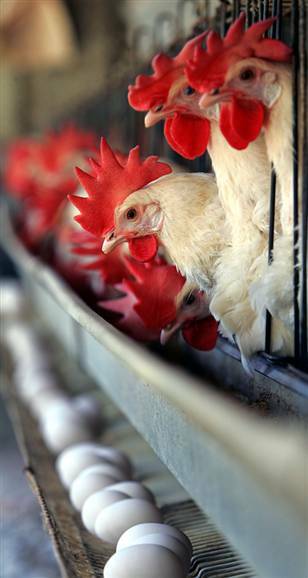 "Understanding how chickens make egg shells is fascinating in itself but can also give clues towards designing new materials and processes," he said. "Nature has found innovative solutions that work for all kinds of problems in materials science and technology — we can learn a lot from them." I am sharing this short video of the Meads' pond. We are blessed to have in the backyard a place of nature and solitude. As you can see the koi are doing wonderfully. 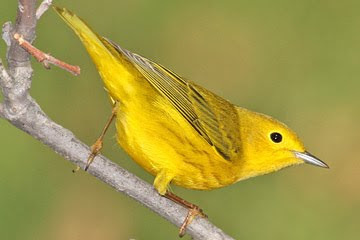 Judy and I have been watching the yellow warblers feeding on the fruits of the Mimosa tree in the backyard. The Mimosa's branches have been laden down with flowers/fruit so the branches are close to the ground. 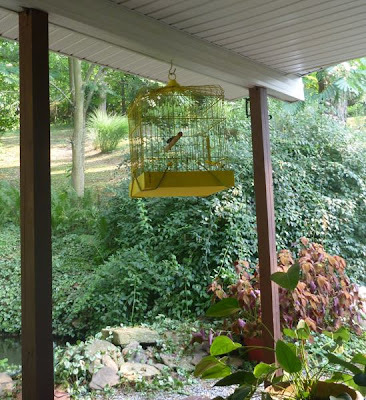 This has been giving us a super view of these birds. Yellow Warblers breed in most of North America from the tunra southwards, but they do not range far southwestwards and avoid the Gulf of Mexico coasts also. The Mangrove and Golden Warblers occur to the south of it, to the northern reaches of the Andes. 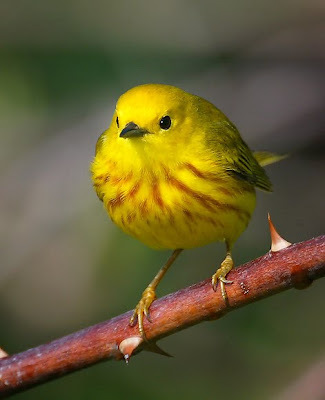 Yellow Warblers winter to the south of their breeding range, from southern California to the Amazon region, Boliva and Peru. 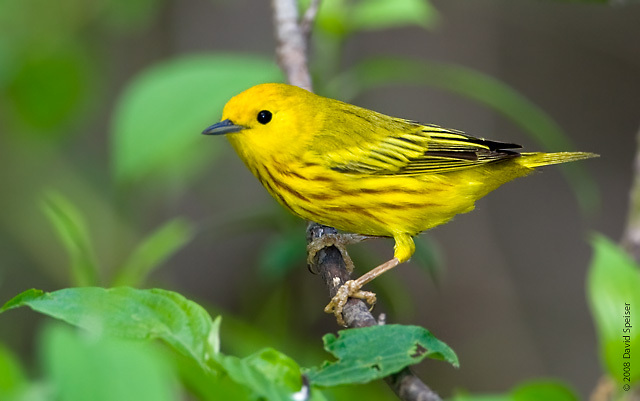 Yellow Warblers arrive in their breeding range in late spring – generally about April/May – and move to winter quarters again starting as early as July, as soon as the young are fledged. 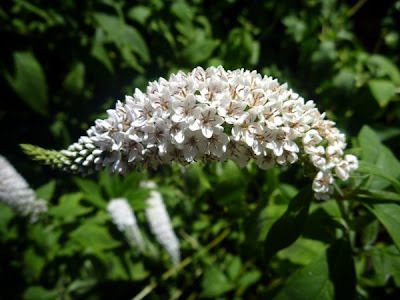 Most, however, stay a bit longer; by the end of August, the bulk of the northern populations has moved south, though some may linger almost until fall. Yellow warblers are easily identified. I am so impressed with birders who are proficient in warbler identification and their special calls. Warblers are mostly brownish or dull greenish in color. They tend to be more easily heard than seen. Identification can be difficult and may be made on the basis of song alone. Judy's granddad had a parrot when she was a kid. We have had the antique cage in the basement for many years. This summer we decided to put it to use. I painted it yellow and filled the bottom with sunflower seed. It worked! 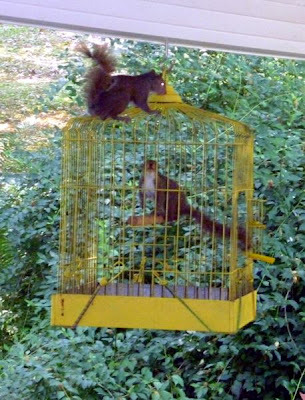 This cage has been a favorite of many birds and, as you can see below, even the gray squirrels decided that this was a great feeder. 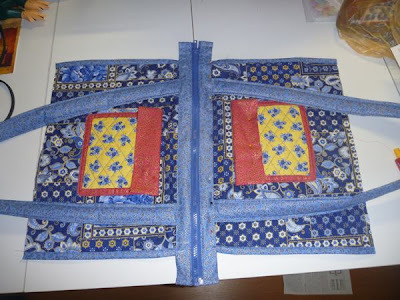 The squirrels have to find the open door which I secured so that it would would not close. It is fun to see the smaller birds land on the cage and quickly go through the wire sides. Cardinals are too large to enter through the wires, so they have to take the squirrel's path - through the open door. 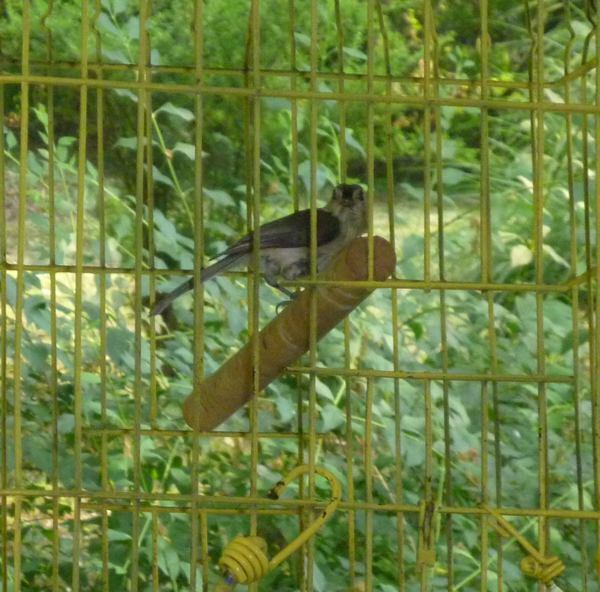 The nipplerats (OK- the tufted titmice) love to use the perch. 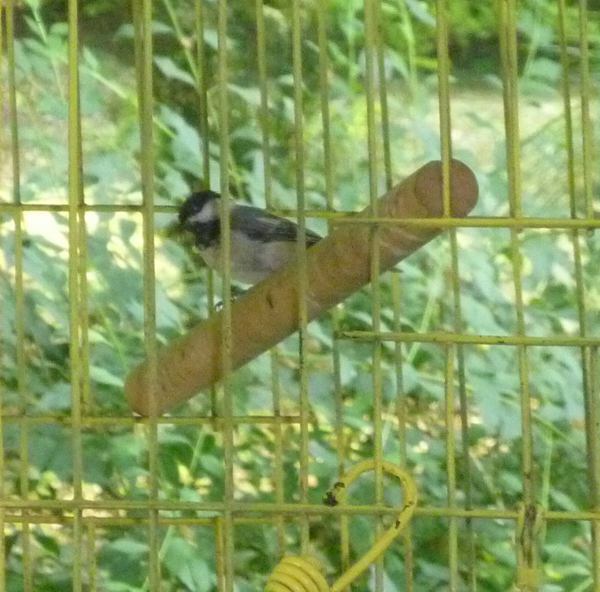 Chickadees visit the cage three to four at a time. Their happy buzz-like call always announces their arrival. 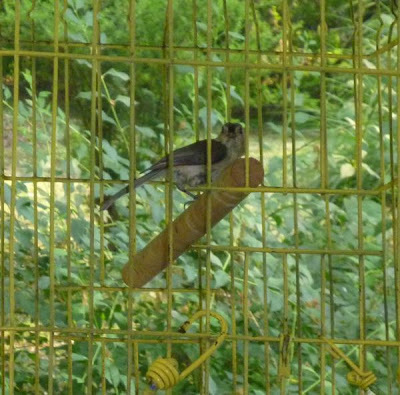 It is a pleasure to sit on the porch and see what critter shows up for lunch in a cage. The parrot is long gone, but birds are still visiting the cage. I think Granddad would be pleased. OK, I love snakes and have kept copperheads and rattlesnakes routinely in my office. 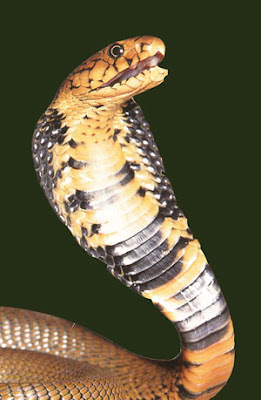 These venomous reptiles were definitely under lock and key. I do think David Jones is just a little off his rocker! Check the article out below! DAMDORYN, South Africa – The most common question David Jones gets asked is: "Are you completely mad?" It's not hard to understand why, since the 44-year-old British carpenter is currently trying to break a world record by sharing a room for four months with 40 of the world's most venomous snakes. "It's a challenge," he told me. "People die all the time when they climb Mount Everest. But that doesn't put them off. This, if you like, is my Mount Everest. I've always wanted to come and sit here with snakes." We'd come across Jones while traveling back from Rustenburg to Johannesburg, after watching Ghana defeat the U.S. in the World Cup. You couldn't miss the signs by the roadside: "World Record Attempt in Progress!" Jones's sparsely-furnished room was at the back of a snake farm, part of the Chameleon Cultural Village. We found him sitting in front of a laptop computer, updating his website (www.snakeman.co.za) and contemplating making a cup of tea, though that would require some care, since a cobra had taken up residence in the cupboard with his tea bags. "I had a cobra try to strike at me the other day, while I was making a cup of tea." He has a bed and small bathroom. The room has windows on three sides to afford a better view to visitors. His roommates include puff adders, snouted cobras, boomslangs, and green and black mambas. "Collectively they are very, very dangerous. They would all put you in hospital. 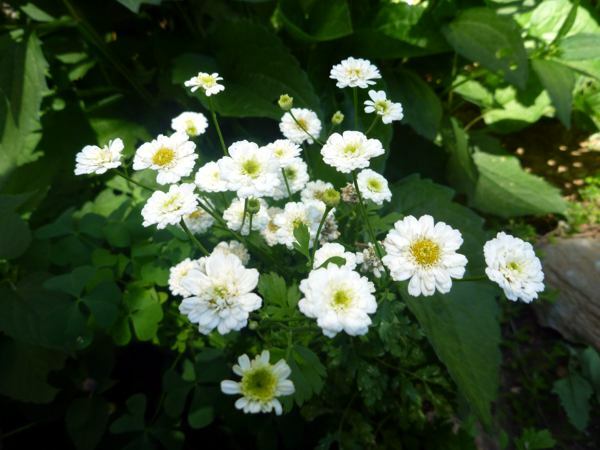 And untreated most of them will kill you," he said. What intrigued me most, though, was the television, tuned in to World Cup soccer. Two snakes were lying on top of the satellite and another on top of the TV appeared to be watching the game. "They seem to watch the movement," Jones said. "But snakes are deaf, so they can't hear the vuvuzelas, which is just as well. I wouldn't want the snakes driven insane by that constant sound." David Jones takes a photo of one of his venomous roommates. Jones has to contain his own excitement, since any sudden movement would attract his housemates. He’s been a snake enthusiast since he was a boy. 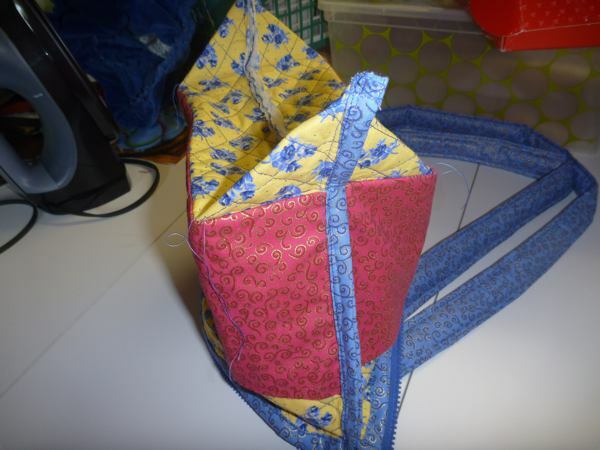 "I do remember finding my first snake when I was ten, and taking it to my house. I was delighted. I kept that snake until it died three or four years later." He says he has to be extra careful of the puff adders. "They move around slowly on the floor. The real danger is treading on them. It's a nasty, nasty venom…They do like my shoes. It’s a nice dark hole." The current snake-room sharing record is held by South African Martin Smith, also known as Mad Martin, who spent 113 days sharing a room with snakes. Another attempt to break the record failed last year; the challenger was hospitalized twice after being bitten by a puff adder and them a cobra. Jones does have a nighttime "minder" who sits in the room and keeps the snakes away from his bed while he sleeps. "Providing I keep my wits about me, providing I do the basics, move around slowly and do look before I move my feet, there's no reason in the world why anything should happen to me," he said. Assuming he makes it through to August, the target, his wife and young son will travel to Johannesburg for the final days. A cheer went up from the television, nearly a goal. A long green snake was looking intently at the screen. Jones resisted any attempt to applaud. "I'm not such a soccer man, really." Which is probably a good thing given the circumstances. Ever wonder what you would do if you won the lottery? What if you won it four times? Joan Ginther might be the first person with an answer to that question. Last week, Ginther won over one million dollars in the Texas lottery for the fourth time. She won the top prize of $10 million on a $50 scratch-off lottery ticket she bought in Bishop, Texas. Her odds of winning were 1 in 1.2 million. Ginther's $10 million is one of three top prizes in the "$140,000,000 Extreme Payout" scratch-off lottery game. Of her four big lottery wins, this is her largest yet. 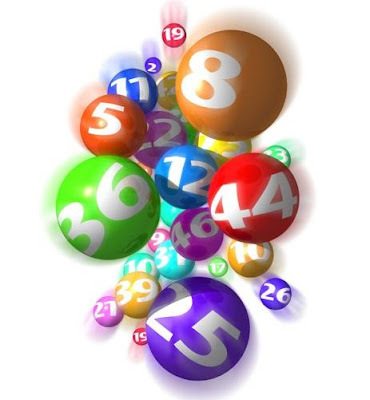 Her latest lotto success brings her total winnings to over $20 million. No one knows Ginther's secret for winning. In fact, no one knows much about Ginther at all. She requested minimal publicity from the Texas Lottery Commission, and did not return calls for comment. Public records indicate that she lives in Las Vegas, and had returned in the past to Bishop to visit her father. Though her father died in 2007, Ginther, a Bishop native, still goes back, perhaps to buy lottery tickets at the Times Market store. Of her four lottery wins, three have come from tickets she purchased in Bishop, and two of those three tickets were purchased at the Times Market. The store is eligible for a $10,000 bonus for selling the winning ticket. A neighbor of Ginther's parents, who did not want to be named, said she comes and goes to her late father's house in Bishop, but said he rarely sees her around anymore. 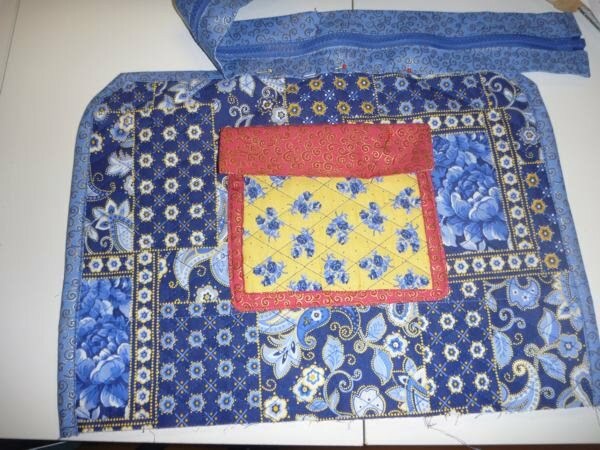 He was not sure if she was currently employed, but thought that she had once worked as a university professor in California. Ginther's lottery success began in 1993 when she won a $5.4 million portion of an $11 million jackpot in the "Lotto Texas" game. Her next win came in 2006 in the "Holiday Millionaire" scratch-off, which netted her $2 million. Her odds of winning those games were 1 in 15.8 million and 1 in 1,028,338. 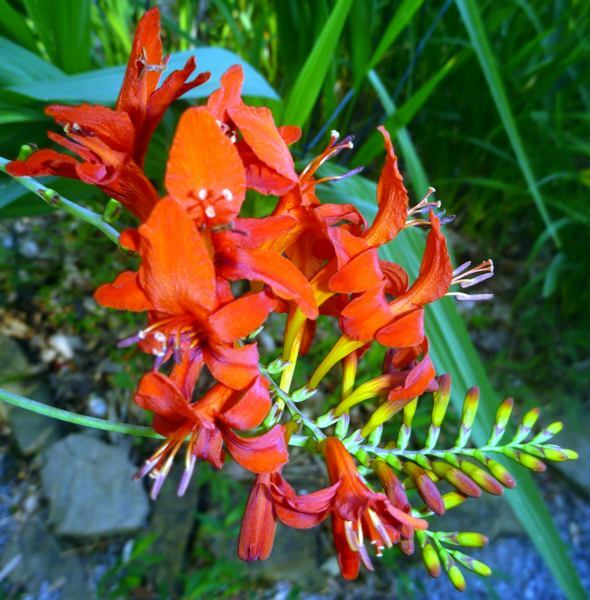 It has been extremely hot these past days in Gilmer County and the high temperatures did not discourage the Crocosmia from producing wonderful blooms. 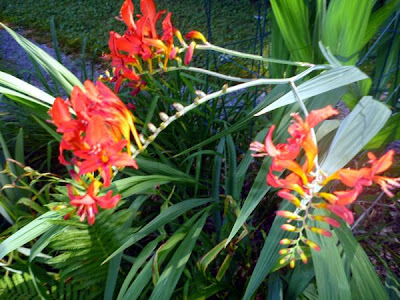 We love the exotic red flowers produced by this plant. The flowers attract humming birds and butterflies and are good in bouquets. Crocosmia is a Greek name meaning Saffron scented, attributed to fragrance given off when dried flowers are put in water. 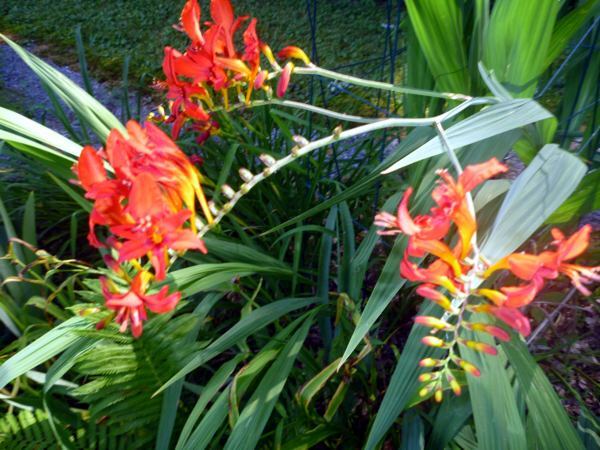 The Crocosmia lucifer is also known as Falling Stars. 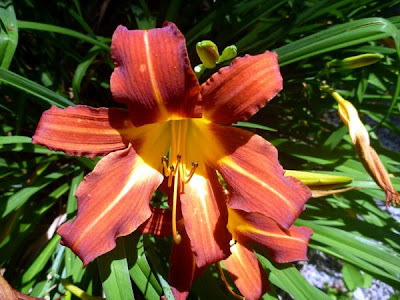 Our plants were given to us by special gardeners who have wonderful flower gardens in Burien, Washington. 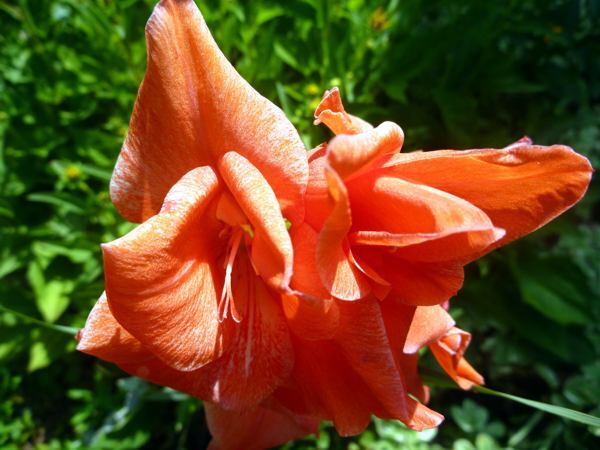 We transported the bulbs back to WV on our last visit with our Pacific Northwest relatives several years ago. Yes, our Nate is walking and learning new skills. Move over Michael Flatley! Nate is competing for your dance skills. I expect that we will see Nate in Lord of The Dance soon! 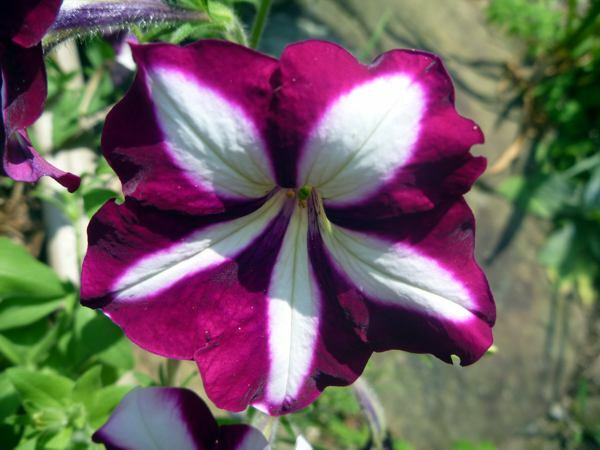 Rachael has worked hard in her garden. 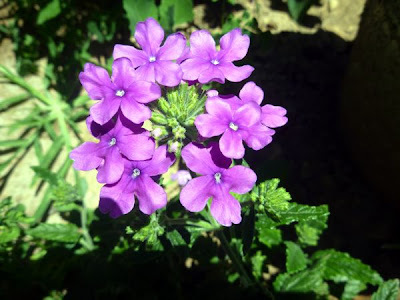 Before we left Shepherdtown, I thought I would take a few flower photos and share them with you. Rachael has a great patch goose-necked loosestrife as seen above. 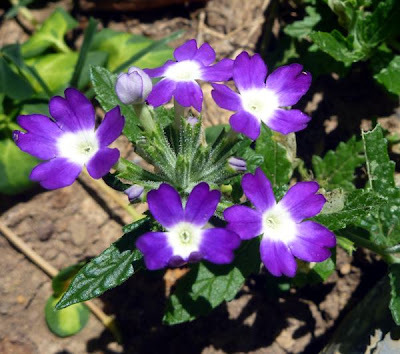 The flowers below are growing along the rock wall in front of the house.